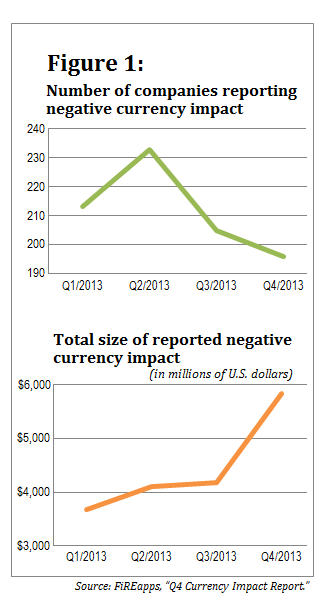 New report shows currency volatility impacted fewer companies in Q4/2013, but for those that were impacted, the effect was large. Three years ago, FiREapps began issuing a quarterly “Currency Impact Report,” which is an analysis of the earnings calls of 846 large, publicly traded companies. Every organization in the study makes 15 percent or more of its revenue outside its home country and does business in at least two currencies. The Q4/2013 report, which was released yesterday, shows a reduction in the number of companies reporting that currency volatility had a negative impact on their earnings per share (EPS)—and yet for those that did experience a currency impact, the impact was large.